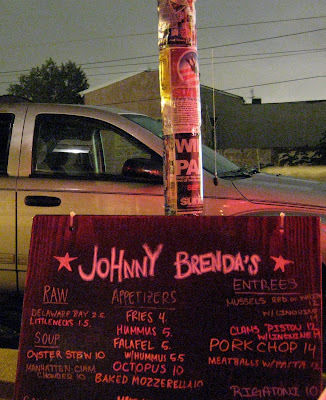 I totally love Johnny Brenda’s for live music, but I’ve only really eaten there a couple of times. I wanted to stop by again. On Friday night, it was pretty packed, but there was one table available outside. It was barely raining outside, and there was awning above, so we snagged it. And actually, it turned out to be a perfect evening to dine outdoors. They don’t have a printed menu as it changes daily. They just have a couple of chalkboards that show what they’re serving that day. Hummus! 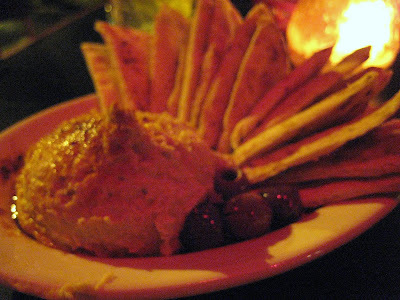 A huge dollop of hummus! With tons of warm pita. Oh, the pita they use here is so damn good. 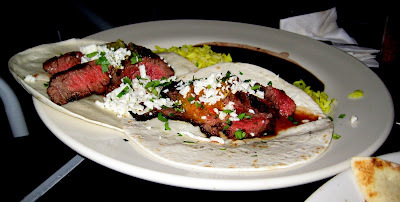 The carne asada tacos. I didn’t try these, but man, these have some big hunks of bloody meat. Yeah! I think one of the tacos ended up having fatty meat pieces, but the other one was glorious. I wanted the mako kabob, but they were out! Damn! 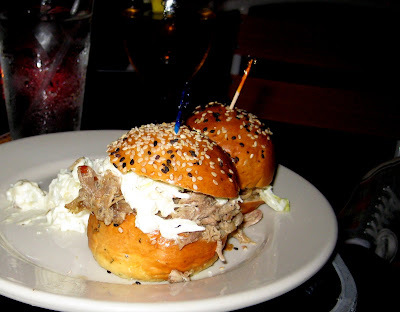 So I asked the waitress which slider I should get, and she recommended the pulled pork ones. Not a bad choice. The meat itself was fairly plain, but there was a good amount of bbq sauce which added just enough flavor. And I was so stuffed on hummus that I could only eat one of these cute little things. The potato salad which came on the side was only blah. The beers could have been colder. And really, is it so hard for places to have a hefeweizen on tap? Sheesh. I also kept commenting on how short the waitress’s shorts were. Gah folks, seriously, they were inappropriately short. I certainly do not need to see so much of anyone’s business when all I’m trying to do is enjoy a meal. I hope she uses some tip money to buy some more fabric.